Symposium is proud to announce that the Horizon EME dispatch and monitoring solution will be providing alarm monitoring for the Toronto Transit Commission. Toronto boasts the third most heavily-used transit system in North America, with a yearly ridership of over 500 million. The EME will, in phase one of the project, provide fire alarm monitoring for the TTC’s subway tunnels, 60+ stations, and other critical transit infrastructure. The new system will replace the current DOS-based software with new state-of-the-art capabilities, and switch out the old receivers for new up-to-date models. It will also greatly expand coverage, including not just the entire underground system, but additional areas as well. The system will be housed in the TTC’s operations center, and will be integrated with an extensive in-field sensor network designed to provide real-time remote detection and alerting for heat, smoke, and other fire-related alarms. The EME will also provide staff with real-time multi-monitor displays that combine sensor information with the maps, floor plans, alarms, and premise information required to enable faster, safer, and more effective response. Operators will be able to remotely monitor and perform diagnostics on the alarm monitoring hardware, and send commands directly to the signal receivers. This enables more efficient handling of false alarms, as well as simplifying routine maintenance. The Horizon EME was chosen based on its ability to fulfill the TTC’s exacting requirements, its ability to seamlessly interface with the required hardware systems, and its proven track record of performance in public safety, military and other sensitive applications. As impressive as the current solution is, it’s only phase one of what’s expected to be a multi-stage project. 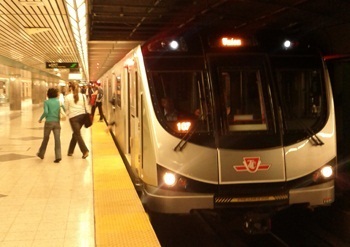 Going forward, the TTC is considering extending the system to incorporate security alarm monitoring, digital video, computer aided dispatch, schedule adherence and mobile applications – capabilities which are all already built-in to the Horizon EME, and can be fully customized to reflect the client’s unique requirements. The new TTC system is another example of how we continue to leverage our extensive public safety expertise into delivering critical infrastructure protection solutions for military and civilian agencies. Unique in the market, Symposium’s systems provide end-to-end incident detection, response and management capabilities, coupled with an open architecture that provides seamless integration with third-party technologies. For more information please contact Symposium by emailing us at info@symposiumtechnologies.com.